Foreword: Android is becoming more and more popular for its openness. The open feature allows any mobile terminal manufacturers to join the Android alliance. Significant openness can make its have more developers and with the increasingly richen users and applications. Such a new platform will mature quickly and become a strong threat for the Apple iPhone. However, a good mobile phone can not avoid the frustrating data loss issue. 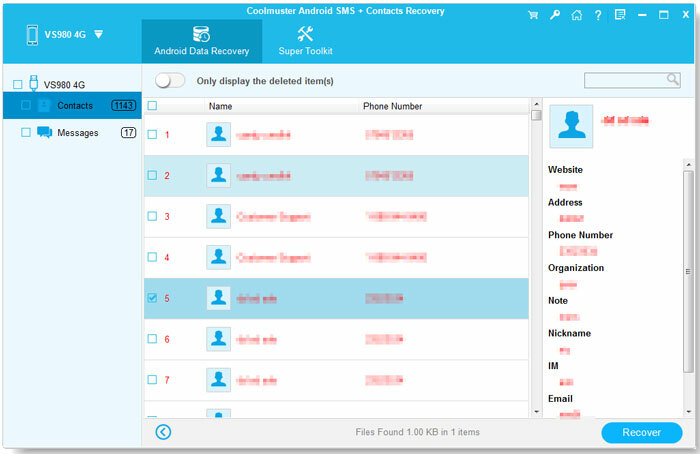 This article will show you how to recover deleted contacts from Android mobile phone. Note: For iPhone users, please don't hesitate to go to another page to learn how to restore deleted contacts on iPhone. As you know, the memory of a mobile phone is growing much that users are used to storing hundreds of thousands of contacts in their phones. But it is really safe to save data in the mobile phone? The answer is certainly no. Contacts you stored in your Android phone can be lost due to various reasons. For example, one you lost your mobile phone, or accidentally deleted the contacts, or mistakenly format your phone, or any other unexpected cases, all can make contacts lost from your mobile phone. Many Android users feel depressed when their contacts have been deleted or lost without making any backup. Is there any solution to restore all deleted contacts back? Yes, of course you can retrieve all lost contacts by using a reliable Android contact recovery tool. Contacts, as well as text messages, are stored in the internal flash memory of a cell phone. When you delete contacts from Android, they were not really erased, but only marked as useless and could be overwritten by new data. Therefore, stop using the phone after losing contacts and pick up Coolmuster Lab.Fone for Android (For Windows 10/8/7/XP/Vista) or Coolmuster Lab.Fone for Android (Mac) to recover deleted phone numbers from Android, as well as text messages, photos, videos, music and other files. - Deeply scan Android file storage system and recover lost data instantly. - Supports to recover deleted files from Android SD card and internal flash memory. - Not only contacts, but also SMS, videos, music, photos, call history, etc. can be recovered easily. - Recover data from damaged, formatted, corrupted Android phone or SD card. Use a data cable to link your Android phone from which you lost the contacts to the computer directly. Once the connection is successful, you can launch the installed recovery software on your computer and get its main interface like below. Next, we need to enable USB debugging on the connected phone. The activated USB debugging is used for synchronizing data between your phone and computer. If you have already opened the USB debugging, you can move to the next step. When the USB debugging mode has been enabled successfully for you Android phone, click "Allow" on your phone to allow the program super user authorization when an Superuser Request pops up. Then, the launched program will automatically detect your phone, including the SD card inside of your phone, and scan them deeply. When the scan finishes, all the contained files in your phone will be displayed in clear categories. 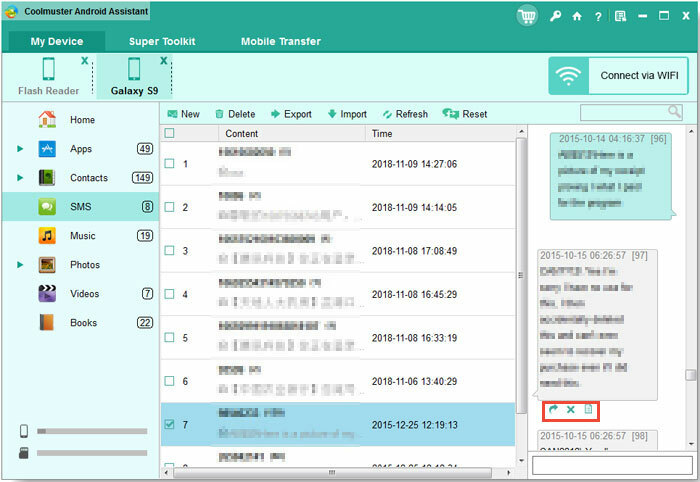 Coolmuster Data Recovery provides you with two preview modes to help you find your wanted contacts quickly and accurately. Preview the scanned out contacts one by one and check those you need to recover. Then, you can click on the “Recover” button, customize an output location and the program will start the recovery process for your Android mobile phone immediately. After a few seconds when the recovery is done, you can turn to the output location and check the recovered contacts. Is it amazing? No any quality loss or data error happens on the recovered data. Just download the versatile program to explore more. How to Recover Call History from Samsung Phone? How to Recover Contacts from HTC One M8/M9? 1. Launch the installed Android SMS+Contacts Recovery on your computer after you downloaded it. 2. Pick up a USB cable to connect your Android mobile phone to the same computer. 3. The recovery tool detects the Android phone and display all recoverable file types on the left panel. 4. Click "Contacts" category on the left and preview all existing and lost contacts on the right. 5. Tick off the contacts you want back and click the "Recover" button. Gmail allows you to restore contacts on your Android device. As long as you have a habit of syncing your contacts with your Google Account, Gmail can quickly restore your lost contacts for you. Follow the guide below to retrieve lost contacts from your Android mobile phones. 2. Go to the upper left corner of the page, select "Gmail > Contacts" and click the drop-down menu. 3. Then in the left pane of the interface, you can see the contact list, click on "More > Restore". 4. After that, a pop-up menu will appear on the screen. On this menu, you can select a time and restore your contact to any state within the past 30 days. Then click "RESTORE" button to begin the contacts recovery process. We kindly suggest you backup your Android contacts time to time on other external drive, in case of losing them some day. After all, backing up data is pretty easier than looking around for ways to recover them back. Here is an one-click method for you to backup your Android contacts. It is Coolmuster Android Assistant or Android Assistant for Mac, which is an excellent Android manager tool to help you transfer not only contacts, but also text messages, photos, videos, music, apps and more from Android device to computer for backup, and vice versa. 1. Launch the Android Assistant and connect your Android phone to the computer with USB cable or WiFi. 2. Connected Android device will be detected by the Android Assistant and all managable data is displayed. 3. Navigate to the left side panel of the program window and choose "Contacts" category. 4. All the contained contacts are scanned out automatically and listed on the right side window. 5. Mark the contacts you want to transfer to computer and click "Export" button from the top menu.